Are you as into the Olympics as we are? Can't.Get.Enough. Joanna posted some awesome Olympic photos this week. Her blog Cup of Jo also has a redesign coming and we can't wait! Did you read The Everygirl's feature on Emerson Fry? Speaking of Emerson Fry, I've been lusting after this orange tie waist dress all summer, but now that fall lines are coming in, this Braid Trim Mod dress caught my eye. I just discovered 9to5Chic and her looks this week are making me excited for fall work wear. Did I really just say that? Loving this list of ways to make those around you feel special, spotted here. Whenever I'm having a bad day a random act of kindness always perks me up. Did you see our "August is best because" feature on Victoria of vmac+cheese? oooohhh!! heading over to vmac+cheese now! that graphic is GORGEOUS, kirby! 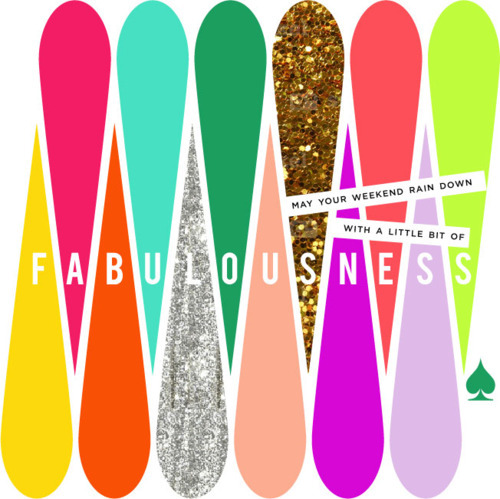 Love the sparkly image and great links! Hope you have a wonderful weekend Kirby! Love Emerson Fry! This list is fabulous :) Happy weekend! That Braid Trim Mod Dress is adorable. Want it! And I LOVE the fabulousness photo you created! I love the ways to make others feel special. I'm actually in the process of ordering a customized fortune cookie for my boyfriend and ship it to his house! Yay! Off to check out your august feature. great friday links! I'm so hooked on the Olympics it makes me feel like the geekiest girl ever.